I was thinking of buying a LCD as the second monitor to be connected to my MacBook. It was all because of the wrong mini-DVI to DVI adapter I bought along with my MacBook. The store should have warned me or given me a choice. With mini-DVI to DVI adapter I must have a monitor, CRT or LCD, which accepts DVI-D signal. I don't have one. Today I bought the right adapter of mini-DVI to VGA for $19 and have it connected to my very old EIZO FlexScan F35 CRT display. 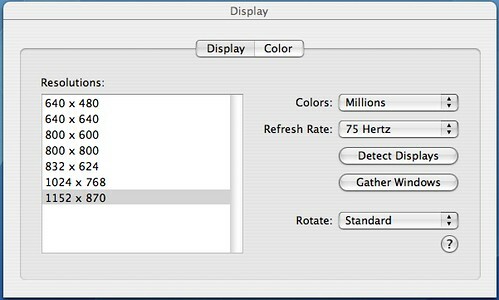 Because the Macbook is of 1280x800 (16:10) widescreen so I picked 1152x 870 for the F35 display. I bought another piece of useless junk it's a keyboard protection skin for $17. The touch is simply terrible that no way I could tolerate typing with it. When the external monitor is connected very quickly MacBook detects it and I could easily set resolution suitable for my monitor. Accidentally I also found that putting MacBook to sleep without it connected to AC supply is a bad idea as the battery will be drained very quickly.